The conference is co-organized by DISTAV – University of Genoa, and hosted/sponsored by the Port Authority of Genoa. Genoa is one of the most important commercial and ferry ports in the Mediterranean Sea, and was subjected to a capital dredging operation for the deepening of the seabed. The port lies in a coastal region of major environmental and economic interest near numerous beaches, marine parks (the Marine Protected Area of Portofino and the Cetacean Sanctuary of the Mediterranean Sea) and protected ecosystems, such as Posidonia oceanica and precoralligenous; here the natural turbidity is low and therefore the preservation of marine environment comes primarily, as often happens in the Mediterranean Sea. The venue of the conference, Palazzo San Giorgio, is a beautiful palace built in 1260. The palace was used for a time as a prison; Marco Polo was its most famous resident and it was there that he dictated his memoirs. 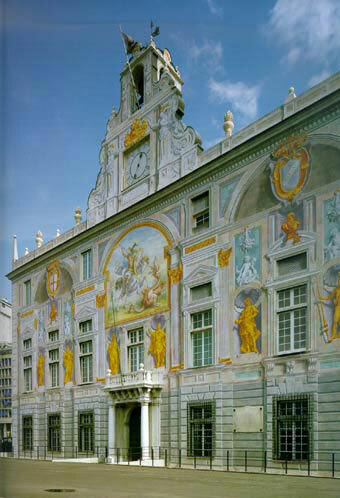 The Palazzo is now seat of the Port Authority of Genoa. Climate change; PIANC and SedNet Think Climate! ensure safe and sustainable development? See the Preliminary Conference programme at the conference webpage (section Downloads). The European projects Sediterra and Sedriport organise pre-conference sessions on 13 June 2017. Participation to these sessions is free for participants of the SedNet conference. On Thursday-evening 15 June a conference dinner is held at the Palazzo Ducale, another beautiful palace in the old center of Genoa. On Saturday 17 June in the morning an excursion by boat is organised to the ancient village of San Fruttuoso, in the Marine Protected Area of Portofino, with the possibility to join a guided visit to the Old Abbey of San Fruttuoso. After receipt of your registration, we will send you an invoice for the conference fee. The ‘Sullied Sediments’ project has been co-funded by the European Regional Development Fund through the Interreg VB North Sea Region Programme with a €2.043.413 grant, which has been matched by the partners involved. The aim of the ‘Sullied Sediments’ project is to enable environmental regulators and water managers make better decisions with regard to the management, removal and disposal of sediment, thereby helping to reduce economic costs to private and public sector organisations, and the impact of these pollutants have on the environment. Many of the inland waterways in Europe are under threat due to the introduction of Watch List chemicals that are not currently regulated by the European Water Framework Directive. These chemicals are introduced into our waterways as a result of our day-to-day activities and through industry. Many have been shown to be harmful to wildlife, causing disruption in the aquatic environment. Regardless of the source, these chemicals accumulate in the sediments in our rivers and canals, where they can remain for years. Regulators and managing authorities do not always know the levels, the locations or the effects of these pollutants. Nor do they always have the tools to assess sediments confidently and make informed decisions about environmental management. An interdisciplinary partnership of scientific experts, regulators, local authorities, agencies and NGOs, led by the University of Hull, will develop and test new tools to better assess, treat and prevent contamination from these chemicals. This work will be carried out at selected sites in the River Elbe, Humber and Scheldt catchments. The partnership also strives to reduce the amount of chemicals entering the water system by raising awareness about what we, as consumers, are releasing into the environment through the use of common pharmaceuticals and household products. This will include the involvement of volunteers in a sampling campaign across the region, which we hope will encourage them to become champions for a clean and healthy water environment. The project was launched formally with a kick-off meeting in Amsterdam in January 2017. Professor Vera Breitung attended the meeting on behalf of SedNet. For more information about the Sullied Sediments project, please visit the project-website at: http://northsearegion.eu/sullied-sediments. If you wish to receive the project-newsletters or would like to contact the projectteam directly, please email Annabel Hanson, Sullied Sediments Project Coordinator, at annabel.hanson@eastriding.gov.uk. The project partnership involves organisations based in the United Kingdom, Germany, Belgium and the Netherlands. 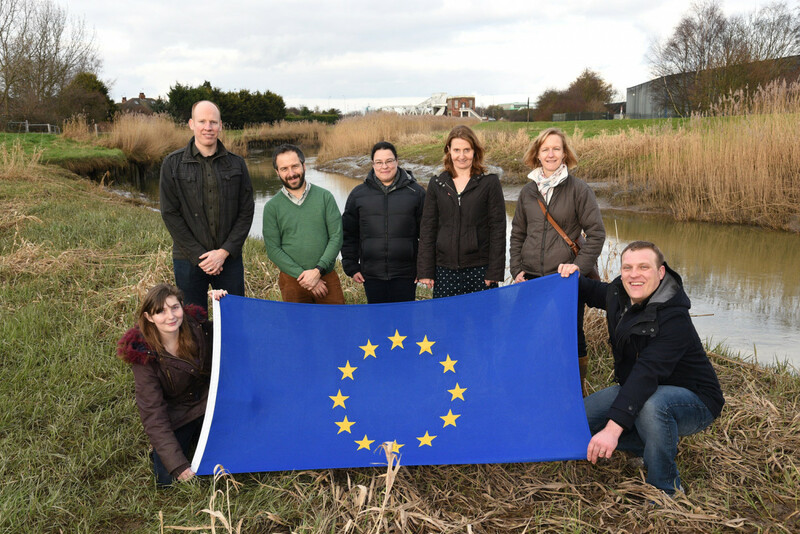 Funded partners include the Canal and River Trust (UK), Ecossa (Germany), East Riding of Yorkshire Council (UK), Environmental Scientifics Group (UK), Hamburg Port Authority (Germany), Hamburg University of Applied Sciences (Germany), Institut Dr Nowak(Germany), OVAM (Belgium), Radboud University (The Netherlands), University of Antwerp (Belgium), University of Hull (UK), University of Leeds (UK) and VMM (Belgium). These organisations are joined by an Advisory Group Partners, namely the East and North Yorkshire Waterways Partnership (UK), Elbe Habitat Foundation (Germany), Environment Agency (UK), Federal Institute of Hydrology (Germany), Foundation for Applied Water Research (STOWA), Hamburg Ministry of the Environment and Energy (Germany), Northumbrian Water (UK), River Hull Board (UK), SedNet Steering Group (European), Thames Water (UK), Vlakwa (Belgium) and Yorkshire Water (UK). To help dredging industry professionals, especially those who are in the position to further the ecosystem services concept within their own organisations as well as project stakeholders gain an understanding of the value of the ecosystem services approach, the International Association of Dredging Companies (IADC) recently commissioned a study. The “Ecosystem services: Towards integrated marine infrastructure project optimisation” study was carried out by the Ecosystem Management Research Group (ECOBE) of the University of Antwerp. A specialist in ecosystem services and a group of experts from the dredging industry were also actively involved throughout the study to provide input on case studies and discuss intermediate results. The ecosystem services (ES) framework helps to analyse the impacts humans have on ecosystems and the feedback effects these changes have for the ecosystem benefits to humans. Today many industries, including those in the maritime sector, are in the process of applying ES to evaluating their processes of manufacturing and delivering products. The aim of this study is to show that with the use of ES a more integrated evaluation of the consequences of maritime infrastructure projects can be achieved. Five projects have been assessed along lines of the Ecosystem Services concept: two projects related to the construction of a new container terminal (Botany Bay in Sydney (Australia), and Western Scheldt Container Terminal in the Netherlands), two projects related to flood prevention management (Sand Engine in the Netherlands, and Polders of Kruibeke in Belgium) and one project with a new offshore windmill farm (Wind farms at sea (C-Power) in Belgium). For each project, the additional benefits (or negative effects) on 14 ecosystem services are assessed, besides the main project targets, to evaluate the integrated consequences of such maritime infrastructure projects. The aim of this project was to assess the feasibility of the ecosystem services approach to gain a more integrated insight, not to make a full societal cost-benefit analysis of the projects. While classic environmental impact assessments focus on the potential negative effects of a maritime infrastructure project on nature, taking an ecosystem services perspective allows to look at both the negative effects as well as new opportunities that may arise as secondary benefits to society. By targeting a variety of ecosystem services from the conceptualisation phase of a project and optimizing its design for additional benefits, innovation efforts shift away from ‘avoiding damage’ to ‘creating opportunities’, avoid destruction that is impossible to mitigate and create support from different stakeholders. The challenge of estuarine management is to maintain existing estuarine natural structure and functioning, to rectify historical damage and negative impacts of human actions which produced socio-economic problems, and at the same time to guarantee present and future economic development. Applying a multidisciplinary and functional, holistic approach is essential to maintain a healthy natural system. Scientists and managers are searching for measures to adapt the ecosystem in such a way that flood risk is decreased, harbour activities can further develop and nature is conserved. This literature review gives an overview of a broad range of management measures that are, or could be, applied for estuarine management, including measures to change hydrology, morphology, biology, and ecological quality. 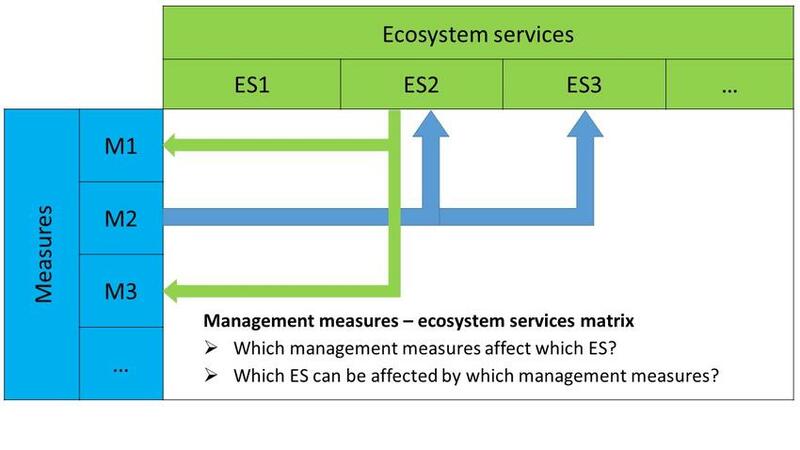 Furthermore, the differences between the different management measures regarding its impact on 20 ecosystem services are identified to detect which management measures could contribute to specific estuarine targets and other relevant ecosystem services. By looking for trade-offs and synergies, opportunities to reduce management costs and increase benefits to society are revealed. This can help, in a first step, to develop an integrated management strategy among the many management departments and with respect to both ecological and socio-economic needs. Full references: Boerema, A., and P. Meire. 2017. 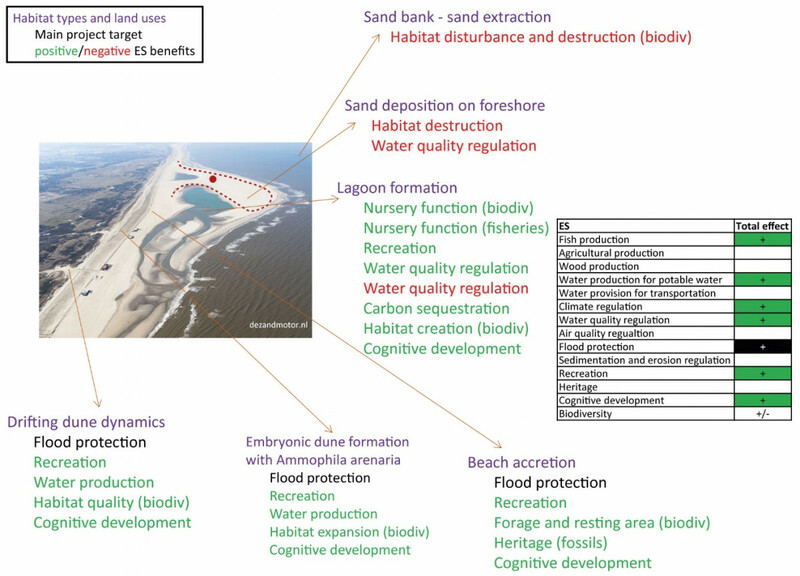 Management for estuarine ecosystem services: A review. Ecological Engineering 98:172-182. Graphical abstract: Management measures – ecosystem services matrix. Since 2000 The Flemish Environment Agency applies a quality Triad approach for the evaluation of sediments, which are monitored through the Flemish sediment monitoring network. The sediment quality triad method incorporates measures of various chemical parameters, toxicological effects and benthic community structure in view of conducting an integrated risk analysis and assessment of sediment quality, taking into account biological and in situ effects. As the applied Triad method was developed for freshwater sediments, the Flemish Environment Agency (VMM), in partnership with the Antwerp Port Authority and the Flemish Department of Mobility and Public Works (MOW), commissioned a project to develop a triad assessment method for the evaluation of brackish and saline sediments. The project, carried out by the University of Antwerp, involved the definition of a set of sediment quality guidelines (SQGs) for micropollutants based on a literature inventory and an evaluation of SQGs quality guidelines. A set of bioassays was tested for their suitability for uptake in a quality triad method for brackish sediments. A sediment contact bioassay with the polychaete worm Hediste diversicolor , a sediment contact bioassay with the amphipod Corophium volutator and a pore water test with the rotifer Brachionus plicatilis were selected for uptake in the test battery. The bioassays were carried out on sediment samples taken along the Scheldt estuary, the port docks and other brackish aquatic systems in Flanders. For the biological component of the triad method, comprising an evaluation of the benthic invertebrate community, a separate evaluation method is proposed for brackish non-estuarine aquatic systems and for brackish sediments in the Scheldt estuary. For the latter the M-ABMI (‘Multivariate AMBI’, Bald et al., 2005; Muxika et al., 2007) and the Buckland arithmetic Occurrence index are tested as biological component in the quality Triad method. The proposed Triad assessment method will be further tested and optimized through application of the method on sediment samples taken in several brackish and saline Flemish waterways in 2017. The method will be published this year and incorporated in the sediment monitoring network of the Flemish Environment Agency. The United Nations Environment Programmme(UNEP) has launched a web app and infographic to support people living and working on coasts in making decisions on how to adapt to a changing climate. Rising populations and climate change are increasing sea level, storm intensity and rainfall. The Coastal Hazard Wheel can be used to consider how different coastlines should respond. The web app opens up access to scientific background material and coastal classification data, in order to aid decision-making and standardise its communication worldwide. An infographic assists in areas with less data by helping users classify their location using things like local geology, tides and hazards like flooding and erosion. It gives 24 different options for coastal management, including wetland restoration and cliff stabilisation. GLOBAQUA is an EU-funded project aiming to identify the prevalence of, and interaction between, stressors under water scarcity in order to improve knowledge of relationships between multiple stressors and to improve water management practices and policies. GLOBAQUA has assembled a multidisciplinary consortium in order to study the interaction of stressors within the frame of strong pressure on water resources. Here you can find the latest issue of the GLOBAQUA newsletter which describes the main scientific results achieved so far, the main outcomes of our public events as well as key news from case studies and the most relevant forthcoming events. If you have any comments or would like to share your point of view you can contact GLOBAQUA through its website www.globaqua-project.eu. 3-6 July 2017: Sample Preparation Summer Course, Chania, Crete, Greece. This 4-day theoretical/practical event covers all aspects of traditional and modern sample preparation procedures with a special focus on solid- and liquid-phase (micro)extraction. All course lectures will be followed by hands-on experiments. Organised by the Technical University of Crete. For more details on the course please visit the website. 18-20 September 2017: 20th International Riversymposium and Environmental Flows Conference, Brisbane, Australia. 29 November – 1 December 2017: 4th Coastal and Maritime Mediterranean Conference, in Split, Croatia. The conference is organized by the French cluster Pôle Mer Méditerranée & Paralia (www.paralia.fr), the Institute of Oceanography and Fisheries of Split, and the University of Zagreb.